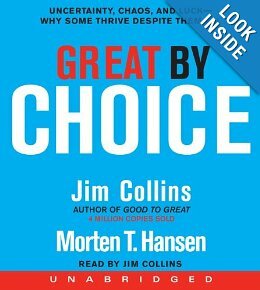 In their book “Great By Choice” Jim Collins and Morten Hansen dispel a number of entrenched myths about what makes companies great in tough times. What do you think about them? Please add your comment below! Entrenched myth #1: Successful leaders in a turbulent world are bold, risk-seeking visionaries. Contrary finding: The best leaders we studied did not have a visionary ability to predict the future. They observed what worked, figured out why it worked, and built upon proven foundations. They were not more risk taking, more bold, more visionary, and more creative than the comparisons. They were more disciplined, more empirical, and more paranoid. Entrenched myth #2: Innovation distinguishes successful companies in a fast-moving, uncertain, and chaotic world. Contrary finding: To our surprise, no. Yes, the successful cases innovated, a lot. But the evidence does not support the premise that successful companies will necessarily be more innovative than their less successful comparisons; and in some surprise cases, the 10X cases were less innovative. Innovation by itself turns out not to be the trump card we expected; more important is the ability to scale innovation, to blend creativity with discipline. Entrenched myth #3: A threat-filled world favors the speedy; you’re either the quick or the dead. Contrary finding: The idea that leading in a “fast world” always requires “fast decisions” and “fast action”—and that we should embrace an overall ethos of “Fast! Fast! Fast!”—is a good way to get killed. 10X leaders figure out when to go fast, and when not to. Entrenched myth #4: Radical change on the outside requires radical change on the inside. Contrary finding: The 10X cases changed less in reaction to their changing world than the comparison cases. Just because your environment is rocked by dramatic change does not mean that you should inflict radical change upon yourself. Entrenched myth #5: Great enterprises with 10X success have a lot more good luck. Contrary finding: The 10X companies did not generally have more luck than the comparisons. Both sets had luck—lots of luck, both good and bad—in comparable amounts. The critical question is not whether you’ll have luck, but what you do with the luck that you get. This is a recommended “Must Read” book!